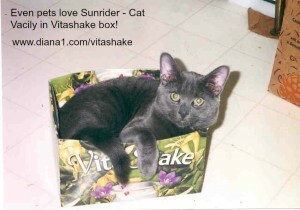 Vitashake is included in Sunrider Recipes – so Delicious, Nutritious and very convenient. Juiced and dried Whole Foods, no junk, no chemicals, no additives, non-GMO, Gluten-free, Vegetarian. Available in 10 pack, Chocolate and Strawberry. Vitashake is “NuPlus Plus”, a great meal-replacement shake. Unlike other brands that contain chemically processed or animal-based protein powders, our soy protein in VitaShake® is similar to super-concentrated tofu. This makes VitaShake® a wonderful nutritious shake for young and old people who require easily digestible food. Also, because we use a whole food base with natural vitamins and minerals in our exclusive formulation, you will absorb more of the nutrients when you eat it. Dr. Chen was asked about the soya in NuPlus. You hear a lot in the health industry about 90% of soy raised in the United States being Genetically Modified … and that soy is hard to digest, etc. Dr. Chen explained that the soy in NuPlus and Vitashake is NOT Genetically Modified and is processed in a way that eliminates these concerns and makes it digestible and usable by the body. pasteurization’s high heat changes the protein structure. This alteration of protein makes it very hard on the digestive system and can create a toxic buildup. Also, the essential flavonoids that naturally occur in soy beans are discarded in that type of isolation method. Sunrider uses a very different and extremely complicated natural process through advanced technology that retains the healthy flavonoids in a complete form without isolating them. The other repository of flavonoids in the soy and other bean’s skins are also added to NuPlus. The body uses this high quality protein to build the cells, immune system antibodies and the building blocks of the body – amino acids. This is superior pure nutrition at its best! Make into balls then roll in added coconut and VitaShake. Vary this recipe and even add sunflower seeds, raisin, etc., if you like. Try Strawberry VitaShake instead of the chocolate. One packet contains one serving of NuPlus PLUS protein, vitamins, minerals and fiber. The fiber in the VitaShake is from FOS which is an extract from chicory root. The vitamins in the VitaShake are NOT isolates! Dr. Chen has combined them with NuPlus in the formulation process. Four VitaShake packets per day supplies 100% of your daily requirement of vitamins and minerals. Calories-95, Fat-less tan 1 gram, Carbohydrates-18 grams, Fiber-3 grams, Protein-4 grams, Sodium-54 mg, Cholesterol-O, Sugars-5 grams, and Vitamins A,C, D, E, K, B6, B12, Thiamin, Riboflavin, Niacin, Folate, Biotin, Pantothentic acid, Phosphorous, Iodine, Magnesium, Zinc, Selenium, Copper, Manganese, Chromium, and Molybenum. Ensure is made from water, sugar, isolates protein, isolated vitamins and minerals, and numerous chemicals. VitaShake is “real” food. The body can NOT digest most protein drinks because they are usually made from “isolated” protein. One VitaShake is equal to 3 Vitadophilus, but the FOS doesn’t just implant in the colon like acidophilus, but also bifidus and faciem bacteria. Most fiber only “sweeps” the intestines, but FOS fiber also aids digestion, thus boosting assimilation of foods through the intestinal walls. When you have enough good bacteria in the intestines, you are better able to produce adequate amounts of B vitamins. VitaShake also minimizes osteoporosis and candida, lowers cholesterol and triglycerides and, over time, brings down LDL cholesterol and boosts HDL cholesterol. It also helps to make you feel full and satisfies and helps with the assimilations of carbohydrates. It is VERY important to drink 16 oz. of liquid each time you have VitaShake. If you mix the VitaShake in only 8 oz. of liquid, be sure to drink another 8 oz. of liqid later to prevent bloating or constipation. As with all fiber, FOS needs to be accompanied by plenty of liquid. VitaShake is a whole food powder made with concentrated herbs, vitamins, minerals, and antioxidants. It helps fill in any nutritional gaps in your diet with the added benefit of whole fiber. This “super shake” is also formulated with coix fruit, a powerful antioxidant, and fructooligosaccharide (FOS), a probiotic soluble-fiber carbohydrate that supports the growth of beneficial bacteria. Phytonutrients and highquality soy protein (similar to superconcentrated tofu) add further nutritional balance. While most protein and nutritional shakes are a cocktail of chemical additives, artificial flavors, and artificial sweeteners, VitaShake is free of those potentially harmful ingredients. It’s a unique product in today’s “shake” market with fewer than 100 calories a serving, no cholesterol, very low sodium, and very low sugar. And because we use a whole-food base with natural vitamins and minerals in our exclusive formulation, your body is better able to absorb the nutrients. Mix VitaShake with your favorite Sunrider herbal beverage for a healthy breakfast, snack, or meal supplement. 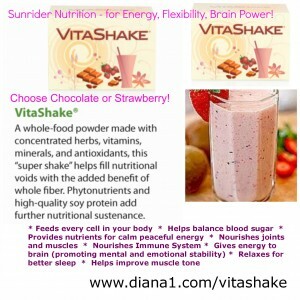 Delicious, nutritious, and convenient, VitaShake is the perfect blend for your life.